These sliders are delicious and great served as a main course or as an appetizer. Give this one a try on your next cookout or Superbowl get together. To prepare sauce, heat oil in a large pot and add onions and saute on medium heat for 5 minutes. Add garlic and cook for 1 minute. Separate whole tomatoes from the liquid, reserving the liquid. Using hand or a fork, crush tomatoes smaller into chunks. Add half of the reserved liquid, chicken stock, and crushed tomatoes to pot. Let simmer for 5 minutes. Add all remaining ingredients. Simmer sauce on medium-low for 15 minutes. If sauce becomes too dry, add remaining tomato juice. Taste sauce and make adjustments needed. If you want a smooth sauce, transfer mixture to a food processor. Pulse 10 to 15 times. The sauce should have some texture to it and not be completely pureed. Add sauce back to the pot and keep warm until meatballs have finished cooking. Leave mixture as is if you prefer a chunkier consistency. The sauce can be made a day ahead and reheated while meatballs are on the grill. Preheat grill for medium-high heat. Combine ground beef with cornmeal, ketchup, onion powder, salt, and black pepper. Form into 2 1/2 inch (in diameter) meatballs. Gently thread 2 to 3 meatballs onto each skewer. Oil grill grate well and place meatballs on the grill. Cook for 12 to 14 minutes, turning 1/4 turn every 2 minutes. Once meatballs reach an internal temperature of 165 F/75 C, remove from heat. Remove meatballs from skewers and add to pot with tomato-red pepper sauce. Coat meatballs well sauce. 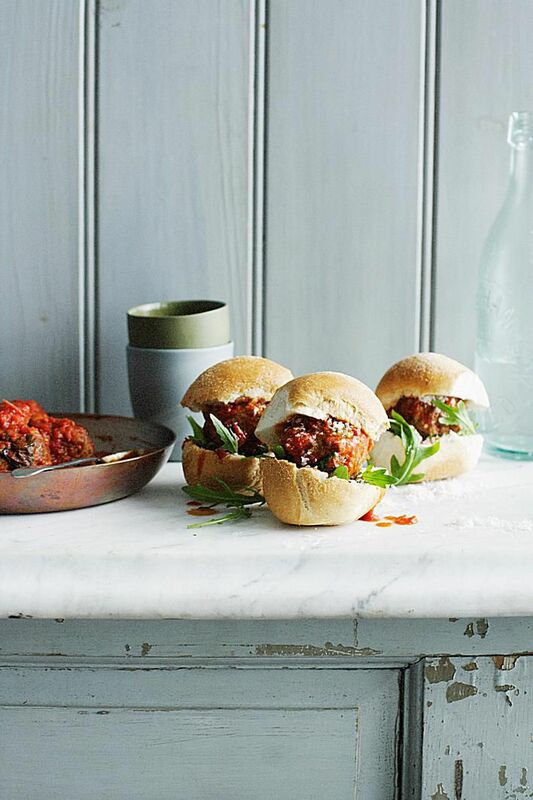 Place greens onto bottom half of slider bun (or dinner rolls), add meatballs, extra sauce, and grated Parmesan. Top with remaining bun half. You can toast the buns if you'd prefer.